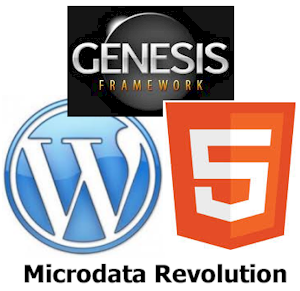 The Genesis 2.0 framework automatically gives you important microdata markup for your entire site. But, just updating the framework isn’t enough. In this series of posts, I help you understand what microdata is and the role it plays in SEO. Plus, you’ll see ways you can include it on your site to get more of your precious info display in Rich Snippets on Google. You’ll see the themes, tools, and plugins that make it easy for you to make the most of HTML5, microdata, and Genesis. You’ll see exactly what benefits you get in Genesis 2.0. This post includes the baseline I started all of my microdata tests with so you can replicate the results for yourself. You’ll see Genesis microdata from the inside, with details that will send your SEO creativity into overdrive. Once you know what you’re working with, you’ll be hooked on microdata too. You’ll see a baseline of how Google indexes a regular site that does not have microdata. Then you’ll see exactly how Google indexes my test site after I add Genesis 2.o. It will give you insight into all the microdata goodies that you get sitewide, without any further optimization. Then see what happens when I add the WordPress SEO plugin with only basic configuration of it and authorship. You’ll want to get yours hooked up right away! You’ll see how I easily updated a Genesis Child Theme to support all of the WordPress 3.6 and Genesis 2.0 HTML5 features. You’ll also see how to do it safely so you can restore your theme, just in case. There are also links to all of the microdata Google now indexes on the same post, before and after the update. See real microdata markup for Person and Event that you can put to use right away. This post is not a microdata coding tutorial. Instead, it will show you the type of content that you can place markup tags around, and all of the rich info Google indexes compared to not using it. This will get you ready for future posts that cover online tools and plugins so that you can choose the one that best fits your needs.